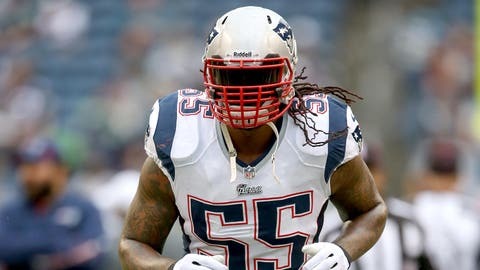 Brandon Spikes was placed on injured reserve on Monday, reportedly because he was late to a team meeting. New England Patriots head coach Bill Belichick will not accept tardiness under any circumstances. Typically, Belichick will send players home if they’re late to practice or a team meeting. Patriots linebacker Brandon Spikes was placed on injured reserve on Monday because he was late to a team meeting last Friday during the bye week, FOX Sports’ Mike Garafolo confirmed Saturday. Spikes was nearly released, but the team agreed to place him on injured reserve so he’d receive a full playoff share. Spikes tweeted that he couldn’t get out of his driveway last Friday after a snowstorm. This is reminiscent of a situation in 2009 when Belichick sent linebackers Gary Guyton, Adalius Thomas and Derrick Burgess and wide receiver Randy Moss home for being late to a team meeting in the snow. Burgess, Thomas and Moss were gone from New England the next season. Spikes was absent from practice on Dec. 4, 2013 for non-injury-related reasons. He also chose to work out on his own during Patriots OTAs rather than spend time with the rest of his teammates. Spikes was having a productive season before injuring his knee late in the year. However, Garafolo reports that he could’ve played this week. Spikes will be a free agent and the Pats are expected to let him leave, Garafolo reports.